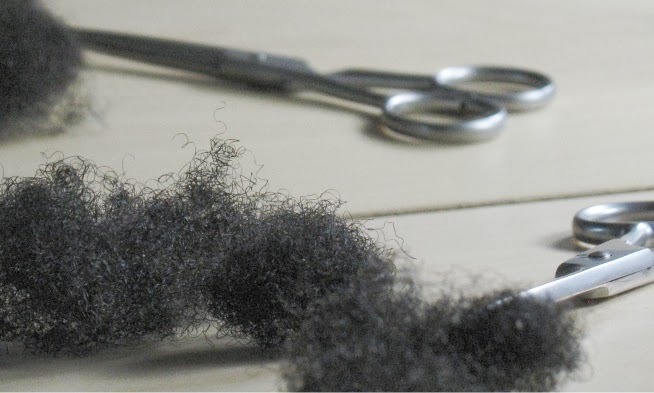 Step 2: What really plagues you about protective styling? I am in love with protective styling. It appeals to my laziness and is especially useful when a ton of projects are piled at my desk. Inspite of my love of braids, protective styling is not good for me when I have time on my hands. I find myself unravelling a braid just to stroke the hair (yes really, quite sad). The only issue is that downtime never lasts long and free hair as lovely as it is means more work. I can and do style my braids (two french braids, side swept cornrow, flowers etc) but the thirst for free hair just cannot be beaten. Step 3: Find a Solution - Move up a a rank! Therefore the hardest thing about protective styling for me is leaving the hair alone. My solution is to break out a book, start studying a language or find something to research.......once I find something to fully occupy my mind, I will stop thinking about the hair. However the ultimate solution to moving to rank 10 is doing smaller braids. They are a pain to take out (meaning you have to patient and slow) are a perfect antidote to the desire to unravel the braids. Laziness always wins out for me and whenever I have the desire to move from 9.75 to 10, the small braids work! So join the 3 Step Program! Step 1: Where would you rank yourself on a scale of 1-10? Step 2: What plagues you about protective styling? Step 3: Find a solution and move up a rank! Protective styling won't last long on me unless I have extensions in. Point blank. Put me in at a 2.5. I was actually just thinking about how much I dislike protective styling sometimes!!! 3. Hmm...idk about this one - I've been asking myself recently: Am I at my hair goal? I know I'm not, but I want to rock my 'fro. Thus, with my goal met - I have a lot less motivation to wear protective styles. Natural Black One - Extensions used to be my main staple years ago but it was a pain to keep them in. I was used to restyling after 3ish weeks. Moving to own hair braids made me push the boundary a little longer - not sure why, I think I like the fuzzy look. Mo - lol on the dislike of protective styling but having a target is always a way to keep your eyes on the prize! Boredom mainly - I have a limited repertoire of protective styles. Some styles I can't do, others I don't like. If I'm busy with school work, then it's great - I forget I even have hair on my head, because I'm so busy. But in the lull between assignments, I find myself watching youtube videos and reading blogs and then touching my twists....then undoing one...and then another...and then my whole head is undone. Will power to stop touching my hair and stop looking at blogs and videos and saying...ooohhh...O_O....I want to try that...! That'd cut my twitchyness down by 80% and push me up to a 9 (Yes! Effective use of mathematics in real life!). I would say a 7. I love protective styling because I don't have to style my hair as often. I am VERY slow putting them in, my parts aren't the bests, and I'm not the most creative cookie. Stop multitasking when styling (taking a break to fiddle around on the internet for example...), use a rat tail comb and big mirror, and try to vary styles. I actually love protective styling and I am currently challenging myself to stop and enjoy some of this length that I've retained. I would say I am about a 10. I did protective styles for all of Fall & Winter of '09 and '10 - now I want to do it all the time. It's amazing what kind of styles you will come up with when you force yourself into a particular style category. I'd say I'm about an 8 for protective styling. I love it especially because I'm busy and work with children who love to put their hands in my hair (ugh!) I usually can only last about 3 weeks straight with braids and then I wear my hair loose for a week and then go back to protective styling. Now that I'm becoming more active I'm finding it easier to stick with the braids. 1. I am squarely in the middle on this one at 5. 2. It gets messed up if I touch my hair, since my hair is very light. Searching for styling products that give weight and don't turn my hair to a crunchy mess is like searching for a needle in a haystack on this little slice of island paradise. I wear two-strand twists all the time. I never wear my hair loose, and I usually wear my twists pinned up or pulled back. Today I'm wearing them down in a kind of bobbed style, and that's pretty radical for me. I don't do it for the protective styling benefits so much (way back in 1998 when I started wearing my hair like this, I knew nothing about protective styling); I do it because I really don't like (and never have liked; not when it was permed, not when it was in locs) being fussed with styling my hair and two-strand twists allow me to be as lazy as I want to be. I retwist usually about every 10 days, but like you, Jc, I am often tempted to undo a twist or do and just stroke my hair for fun. I am going to rank myself at a 7. My child. She is tender headed. And despite doing braids on her hair for years she still screams through the whole process. No more braids for her for a while. She will be in hanging 2 stranded twists until she can promise not to scream on me. Guess I am just waiting until I have a willing participant. I rank myself a 5. I think protective styling is great, however, I do not like the way I look in them. The reason I ranked myself right down the middle is because I’m open to it IF I can find something attractive for my face. I will do a bun in a heartbeat but that’s about as protective as I get. I tried a 2 strand twist for the first time in almost 10 years of being natural and it was just ok. It served its purpose. Today I am wearing a new protective style. It’s basically a style from the 80s (2 big flat fat twists going towards the back of my hair). Step 3: Find a Solution - Move up a rank! My solution is to keep experimenting with styles, explore more YouTube videos and learn to like my face more. I would say a 5. I resort to protective styling when I don't feel like doing my hair, so it's about 50/50. The cuteness factor. My protective styles just do not look as cute as my hair when it's out. Then again, I also don't try to look as cute in my protective styles, lol. Once I go protective, I'm basically not even trying to be cute about it. I guess I could try to be more creative with my protective styles so that I'm drawn to them more. But...I doubt it will. I'm ok at a 5. I can't see this improving until I have noticeable length retention as I figure last year playing in my hair lost me at least 6 inches of growth. 1. I'm an 8, I like to leave my hair alone as much as possible. I wore cornrows about 99% of the time growing up. I guess that's why I prefer it this way. I style my own hair so it usually needs to be redone more often than if a professional did it. 2. What plagues me? My skills and time! I can do cornrows, twists and braids but I am not nearly as good as a professional. I LOVE variety, but there are so many styles I can do that look presentable. It also takes time I'm not as fast so this is something I have to put on my calendar. Sometimes I'll pay someone to do it. Sidenote: I also don't mind a small amount of fuzz but alas most people around me do. Hence the need to redo the styles and find ways to make them longer wearing! To me "protective styles" are styles like any other. I think some people see them as some sort of punishment because of the term "protective". 1. I rank at (4). I use extensions (yarn braids) for my protective style where I get growth and don't loose my hairline. 2. I wish my hair was thicker to do protective styles on my own natural hair; otherwise, you will see lots of scalp. Sorry...not going for that look. 3. Once I get length or enough hair that can cover up the scalp for these protective styles, I will move into doing styles with my own natural hair. In the meantime -- I LOVE MY EXTENSIONS! I'd say I'm a 9. I lived in protective styles as a kid (although, mom and I didn't ever know the cornrows she'd put in were called "protective styles"). Protective styles are much harder for me now, since I began caring for my hair properly, last year. I begin to crave a finger detangling session, or just letting water run over my scalp and strands, in the shower. In the past, I never had to deal with "missing" my hair, and wanting to feel it loose and free. I have to talk myself down, when I start getting stir crazy after just the first week in a style that is supposed to last me 3, 4 or more weeks. Find cuter protective styles! 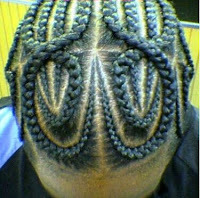 I'm not competent at cornrowing, so I really need to work at it so that I can start doing cornrow styles for myself. I'm so sick of twists and single braids I could spit. But, I have an unending love affair with cornrows, and they just might be the cure for my protective styling malaise. 5 - protective styling my hair is ok when I have either a sew-in or extensions. My hair is short, so I don't like how twists or braids w/o extensions look, but I can't do them myself, so I have to find people who 1 - won't braid too tight and 2 - are not expensive. Well if I practice I could possibly do extensions myself. I would rank myself at 1..lol. Hey, Thought I was the only one who took out one braid to play in it...I am stroking my hair as we speak since I have been in braids for the 4th week now. Step 3: I just need to realise that protective styling helps my hair and its easy!! Thats it! Its easy no dealing with your hair everyday..hence a thorough appreciation of the joys of protective styling. You're spot on with step 3. I've pretty much just blogged about that today. The single plaits are going in. Much as I love my hair, my fingers need to be occupied with something else for the foreseeable future. Cue single plaits for as long as possible. Apologies, I didn't address steps 1 and 2.
step 1: Prior to my hair journey, it was a walk in the park 10. Currently it's an 6. Step 2: I get really anxious about the condition of my hair when it's in a protective style because I just can't tell. I worry that it's not getting enough moisture/protein and that it's looking messy. I dread product build-up more than ever before. 1)I'd say I'm a 7. Currently in my sixth week of bantu knots and loving how easy and stylish they are! 3) Keeping up the moisturizing when I'm wearing a protective style. Unless my hair can thicken up, I'm afraid there is not solution! I am still trying to find a solution. I want to embrace more protective styles..
1. i am at ~9.5. i love protective styles - they save me a ton of time in the morning. i have been wearing protective styles for about 14 mos straight (abt a week break here and there). 2. i sometimes want to wear my hair loose when i have my protective style in...but when i do wear it loose, i realize how style challenged i am and why loose hair isn't always bomb. 3. i need to get over my aversion to having someone else doing my hair that i developed after going natural. i will get my hair cornrowed (no extensions) when i go on vacations so that i can be as creative as i want and not have to mess with my hair or think that i should play in my loose hair. i have an appointment to get my hair cornrowed next week! 1: Where would you rank yourself on a scale of 1-10? About a 9.5 - I love keeping my hair in my minibraids (just my hair) for up to 5 weeks per stretch. Just took a set down. 2: What plagues you about protective styling? I am somewhat limited because I can't do very intricate canerow designs on my own head. Now with my fave PS (minibraids) the downside is the long installation and takedown time, but really it's the price I pay for how small I choose to make them. I like making them small as I can do more with them, but it is currently taking around 9 hours (split over 2 days usually) to do. 3: Find a solution and move up a rank! I've gotta get practising with my flat twists and canerows so I'm able to extend my DIY capabilities and give myself some variety without having to depend on others. I LOVE protective styling and find myself much more creative when my hair is in twists/braids than when my hair is loose...and I find that updo's are really more classy than out do's. With that said, I probably rank only at about 7...out of sheer laziness. If I don't take the time to put in small twists on wash day, then its not happening. On wash day I'll air dry in medium/large twists - and will often wear them for a few days until they start to fuzz and look old, then I twist out. My twist out devolves into a puff shortly thereafter and that's all she wrote until next wash day. A solution would be to devote more time on wash day to putting in my style (instead of waiting until 8pm on Sunday night to wash!!!) It would ultimately save more time and more hair. I would say on a 1-10 I would be a 4, I'm not that goos at them. I have styles in mind but don't know how to execute them and can't explain them properly to others. What plagues me is finding time to do them. With 3 babies finding the time to practice doing them myself (which I desperately need) or getting someone to do them for me is hard. Also once it starts looking a little old, especially with canerow, I want to take them out. To move up a rank I'll have to practice quick updos and plan visits to the salon or arrange for someone to help with my hair well in advance.